Hugh Harrison is at his 16th Grey Cup and it shows. The Hamilton Tiger-Cats superfan wears a coat made of team flags to the annual pancake breakfast. He hardly flinches when Canadian Football League commissioner Mark Cohon jumps into a group photo. "We see him all the time," Mr. Harrison explains with a smile. The 67-year-old has made the trek to Vancouver from his home in Sudbury, Ont. Traveling for football is nothing new – he used to have Tiger-Cats season tickets and would drive 5 1/2 hours each way for home games. When asked which Grey Cup event was his favourite, Mr. Harrison first cites 2003 in Regina. He politely adds that every city has its charms and compliments Vancouver, though he says it does differ from some CFL communities. "I kind of equate Vancouver to Toronto," he says. "There's so much going on in the big city, the CFL and the Grey Cup kind of takes a second chair to it." Bill Meikle, a 31-year-old from Edmonton at his sixth or seventh Grey Cup (he can’t immediately recall), echoes that sentiment, though he too is careful not to offend. The Roar on the Shore, as this year’s Grey Cup event is billed, has felt more like a murmur, lacking in buzz, easy to miss. Attention on the game is largely confined to older Canadians. Thousands of tickets remain unsold, with brokers slashing their prices in half, a departure from demand in recent years when the big game hasn’t been a tough sell. In 2010, Edmonton sold out the Grey Cup in three days. The 2011 Cup in Vancouver was sold out by July, even though the B.C. Lions were in the midst of a horrendous start – and they did storm back that season to win the title. Toronto sold out the Rogers Centre for the 100th Grey Cup by midsummer. Regina, the pulse of the CFL, did the same at Mosaic Stadium last year. Polling data released by the Angus Reid Institute this week suggests the CFL’s impact could be slipping in this region. Nearly one in two British Columbians closely follow the National Hockey League; only one in five closely follow the CFL. The National Football League south of the border is nipping at the CFL’s heels, with 18 per cent of people closely following it here. Major League Soccer – Vancouver’s Whitecaps recently completed their fourth season by making the playoffs – has climbed to 13 per cent. A local ticket broker says the difference between the market for Lions and Whitecaps seats is mostly negligible. The poll says the CFL also faces a generational challenge, with Canadians aged 18 to 34 twice as likely to not watch the Grey Cup as those who are. There are challenges, organizers of this year’s game admit, but they note that more than 50,000 tickets have been sold, a fact that can hardly be cause for alarm or hand-wringing. They say the event has been hurt by a number of factors, including the fact that Vancouver hosted the Grey Cup just three years ago, and that the home team didn’t advance to the final this time around. The CFL also saw scoring decline to a three-decade low this season. Organizers note the last Grey Cup staged in this city generated more than $100-million in economic activity and express confidence that as the weekend rolls on, the buzz will become more electric. A small but important change has been made. In 2011, the party that is ballyhooed by some as “the grand national drunk” was spread out over two separate areas. This time, the party is staged in a single nexus, in and around the convention centre. The aim is to create a small-town feel – Main Street in downtown Vancouver – and overcome the big-small divide that is apparent between CFL cities. Vancouver has a complicated history with the Grey Cup. The city hosted five CFL championships in the 1950s and 60s and police would typically make scores of arrests. The Grey Cup riot of 1963 saw people hurl bottles, flip vehicles and dance in conga lines along Granville Street. Recent Grey Cups have been far more tame. No significant incidents were reported to Vancouver police in 2011. 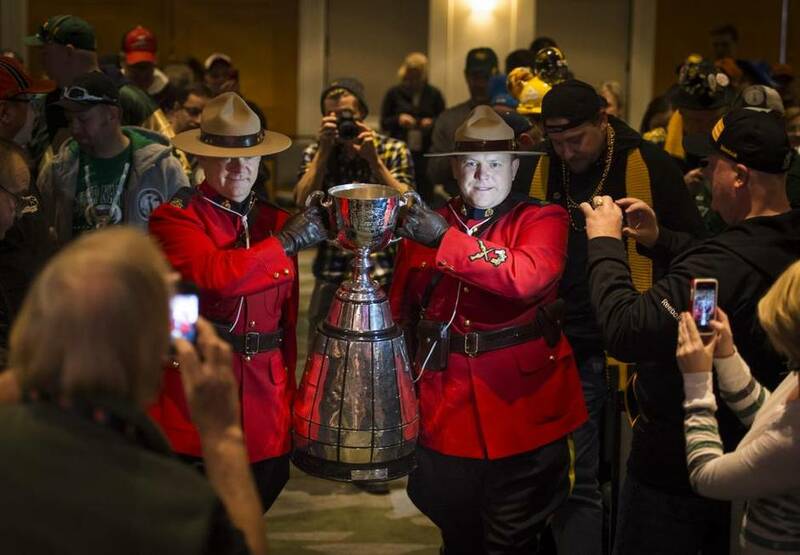 Sergeant Randy Fincham, a department spokesman, said the force is “not anticipating significant problems with the 2014 Grey Cup.” He added, however, that the department does have plans in place to cover a number of scenarios and will focus on public consumption of alcohol. This year, the Grey Cup arrived in Vancouver by sea, with an assist from the armed forces. Mr. Cohon, the CFL commissioner, Wednesday carried the trophy off the ship and onto a podium, where it was blessed by a First Nations group. When asked how he would evaluate Vancouver as a host, Mr. Cohon said the league has had success staging Grey Cup events in both large and small cities. “Each of them have their own flavour and their own feel,” he said. Attendance for the Lions has tumbled the past several years, falling 8 per cent to 252,000 this year for nine home games from 273,000 in 2012, the year after the Lions won the Grey Cup. Mario Livich, president of ShowTime Tickets, said the price of some of its Grey Cup seats has been slashed in half. He said the seats were too expensive from the outset, with some in the upper reaches of B.C. Place going for about $300. Mr. Livich said a lot of local buyers want out of their tickets for various reasons. Some are Lions fans who thought their team might make it to the final, he said. Others bought the tickets thinking they could turn a profit. He said sales of CFL tickets have been slow in general and the push for Lions tickets is about the same as for the Whitecaps, depending on the opponent. The number of unsold tickets as of Friday was about 2,700, down from 5,000 earlier in the week. But Jamie Pitblado, general manager of the Grey Cup festival, said ticket sales for Vancouver events have been slow in general, whether for sports or concerts. He noted the Canucks saw their 12-year sellout streak end last month. The last Grey Cup generated approximately $118-million in economic activity, Mr. Pitblado said. He said he hoped to better that mark this time. In comparison, the Celebration of Light fireworks event has an economic impact of about $39-million, its spokesman said. Tourism Vancouver says the Grey Cup is expected to account for about 20,000 hotel room nights – which is roughly the same as the NHL’s Heritage Classic from earlier this year. But spokesman Walt Judas acknowledged expected visitor spending for this Grey Cup – between $30-million and $40-million – is below the $42-million estimated for the last one. #Greycup2014 Party at school today! #Stampeders organizing committee brought cowboys, clowns, and more! The Grey Cup would not be alone in having a tougher time revisiting Vancouver. SIGGRAPH is an annual conference on computer graphics and interactive technology that draws everyone from developers to artists and business people. In 2011, the conference accounted for nearly 16,000 hotel room nights, according to Tourism Vancouver. This year, in August, the number was down more than one-third to 10,000. Those involved in Sunday’s game, though, are unconcerned with all the numbers. Ron Wild and Jori Toniello, two of the well-represented Saskatchewan Roughriders fans who made the trip to Vancouver, said nothing will top last year’s game, when their team won the Grey Cup at home in Regina. But Vancouver has its appeal, they said. For instance, Mr. Toniello could wear shorts in late November. And, indeed, last year’s Grey Cup was the most-watched sporting event in Canada in 2013, an average of 4.5-million people – usurping the Boston Bruins-Chicago Blackhawks Stanley Cup final.